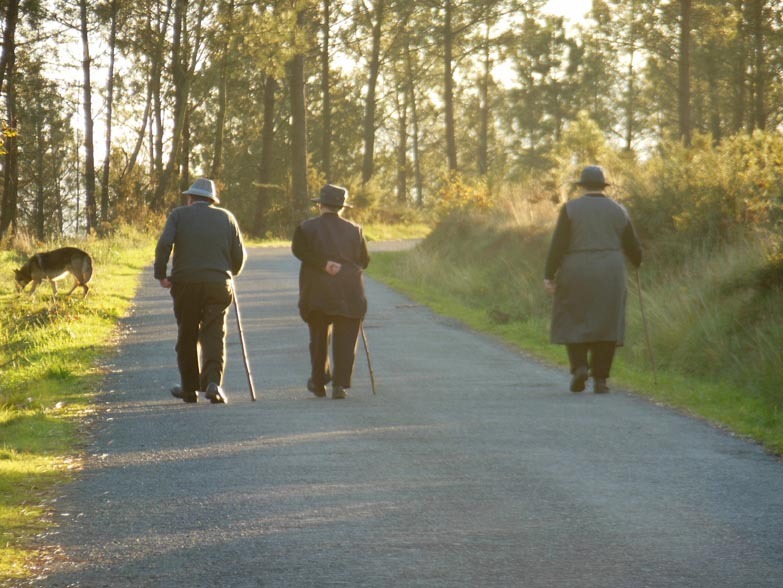 Close to Finisterre, I saw these three elders ambling. Such was the sage advice of Maribel, the bleach blonde squinty eyed proprietress of an albergue in Cizur Menor, on the outskirts of Pamplona, where I stayed a few nights ago. As each pilgrim stumbled into her courtyard, hot and weary from the journey, she asked them if their feet hurt and showed them how to lace their boots to avoid getting, or exacerbating, shin splints and blisters. And she urged everyone to slow down. I thought of her today as other people whizzed past me on the Camino, as if they were speed walking to Santiago de Compostela, the destination, only a few hundred miles away. While it´s easy to get caught up in other people´s momentum and in the excitement of the journey, I wondered if these people were missing out. Had I been more in tune with my own rhythms when I began this adventure, I probably would have paced myself better, especially on the pavement, and avoided getting shin splints. Those forced me to recuperate for nearly a full day at a convent (now albergue), where two fig trees flourished in the walled garden. Resting there, I relished in the fresh fruits. Since then, I’ve taken my time and have been more careful on hard surfaces. Others are also taking a more leisurely pace. A New Mexican man pointed out blackberries along the trail, which I had missed when I was focused on my daily mileage. An Italian, in the slow lane, showed me almond trees that I would have overlooked or simply not recognized. He shook a branch so we had an afternoon snack. Just today, I’ve seen so much: dark grapes clustered low on the vine, trees bursting with figs, enough blackberries to feed a large family of bears. From the moon glinting behind clouds early this morning, to the pink and orange sunrise, to the grey cottony cumulus of the afternoon, the sky alone has offered an endless panorama. The Camino is NOW. It´s not better in Compostela. I wonder how many speedy pilgrims saw it. He talked about getting up in the dark, walking with the stars overhead, etc. etc., but the fact is that if he did this in twenty-one days, he walked nearly 40 Km per day. Is it a race??? I know . . . to each his own Camino . . . but I am happy it took me 42 days, including 8 days of down time in between. It was harder than I expected, easier than I thought it would be early on, I’m so much stronger than I thought I was, and am about 15 lbs lighter than when I began. I miss walking. I’m not sure what will happen when I get back to Colorado. But I hope I remember that no matter where I am, my Camino is NOW. HERE. Congratulations on finishing! Yes, I miss walking long distances, too, especially since I’m STILL healing, and progress is slow. Enjoy your time in Portugal!